Where Julie Goes, Music Follows: Review: "Django Unchained"
I celebrated the arrival of 2013 with my husband and Quentin Tarantino on New Year's Eve. His latest film "Django Unchained" was released in theatres on Christmas day to the delight of Tarantino fans everywhere. The film stars Jamie Foxx, Christoph Waltz, Leonardo DiCaprio, Kerry Washington, and Samuel L. Jackson. The film is set in the 1850s, a time where black slaves were sold to white folks to work on plantations in the Deep South. 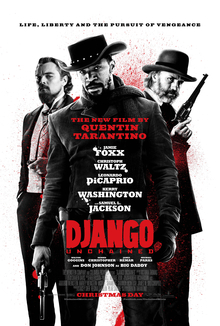 A bounty hunter (Waltz) recruits a black slave (Foxx) to help him find his targets, then decides to help his new friend rescue his wife (Washington), who has been sold to a rich plantation owner (DiCaprio). This film feels like a true western with a funny twist. All the actors in this film did a phenomenal job. I'm not particularly a fan of Foxx but I must say that he did a great job in the lead role. I was cheering him on during the whole movie. Also, having never seen Waltz in a film before, I must admit that I was completely smitten with him. You cannot help but fall for his character. The dynamic between these two main characters is fantastic to watch. DiCaprio also delivers a very funny performance, as the flamboyant Monsieur Candie. This film contains many elements that are Tarantino-centric, including an epic fight sequence, interesting camera angles, random tangents/dialogues, a long monologue by Samuel L. Jackson, and various cameos by the director himself. I need to mention the soundtrack. The music in this film is fantastic. I was pleasantly surprised, especially when Tupac started playing during the main fight scene. I found it very fitting and totally badass. Another element of the film that I absolutely loved was the wardrobe, especially Django's outfits. Overall, this movie is very entertaining and will definitely please Tarantino fans. Worth checking out! Nice review Julie. It's a bold, bloody masterpiece from Mr. Tarantino. It's sad because I read an article recently that Mr. Tarantino is thinking about retiring from filmmaking in the future. While I respect his decision, it will be a sad day indeed. Hi Dan! Thanks for reading my post. I did not realize that Tarantino was thinking of retiring. He is such a unique filmmaker... Pulp Fiction will forever be my favourite film!